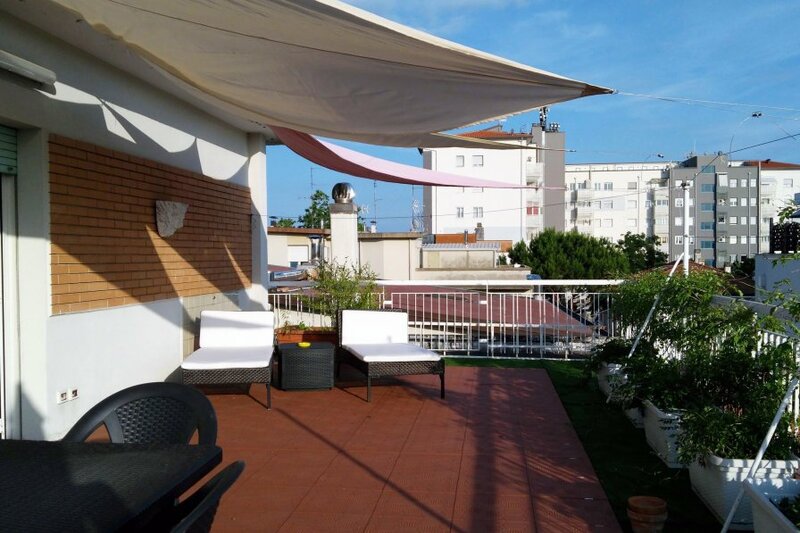 This 2 bedroom apartment is located in Riccione and sleeps 4 people. It has WiFi and air conditioning. Elegant and comfortable loft located in the heart of Riccione just 700 meters from the beach, reachable in 4 minutes on foot, in front of the Palazzo dei Congressi, and only 200 meters from the train station. This apartment is an ideal location for Digital Nomads who want to live an experience in one of the best quoted location of italian beaches, The Riviera Romagnola. The house is located on the third floor without elevator and consists of a large living area with relaxing sofa, flat screen TV, dining area and two French windows one of which gives access to the wonderful panoramic terrace furnished with relaxing sofas, tables and chairs to eat outside, umbrellas and sunbeds. From the living area you can access the kitchen through a casket door and available to guests there are dishwasher, electric oven, microwave and all the main tools to have the same comfort of home. The sleeping area consists of a very large double bedroom with a double bed, wardrobe, chest of drawers, bedside tables, a second bedroom with bunk beds, and a bathroom with sinks, built-in sink, bidet and tub with shower. From the sleeping area leads to the second wonderful panoramic terrace overlooking the sea side and offers a very relaxing view. The house offers functional and modern furniture and has been completely renovated to ensure maximum comfort for guests and is ideal for families up to 4/6 people and is equipped with air conditioning and heating. Within a few minutes walk you can find restaurants of typical Romagna cuisine, bars, supermarkets and bazaars.